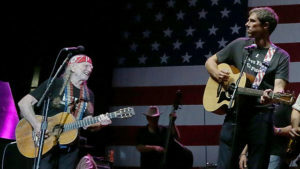 Legendary Texas musician Willie Nelson announced that he will headline a concert and rally in support of Texas Senate candidate Beto O’Rourke. It will be held at Auditorium Shores in Austin on the night of September 29. The concert will be open to the public, via registration at www.betofortexas.com/beto-willie, and feature musical guests Lukas Nelson & Promise of the Real, Particle Kid, Carrie Rodriguez, Tameca Jones, and Joe Ely. O’Rourke will be in attendance and address the crowd. This will be the first public concert Nelson has held for a political candidate. O’Rourke is running for the U.S. Senate seat currently held by Ted Cruz, and has already visited all 254 counties of the state. The El Paso Congressman’s campaign has sworn off all PAC money and is being run in a grassroots fashion that includes town halls across Texas where O’Rourke can take questions from those he wants to serve and represent. 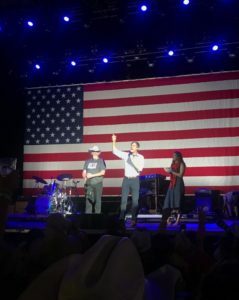 O’Rourke recently appeared as a guest at Willie’s July 4th Picnic, where he joined the band onstage to play guitar and sing during the final medley of songs. A recap of their set has been viewed hundreds of thousands of times. The September 29 concert will be held on the shores of the Colorado River with a backdrop of downtown Austin. Registration for the event is www.betofortexas.com/beto-willie. This entry was posted on Saturday, September 15th, 2018 at 8:51 pm and is filed under Good causes, Politics. You can follow any responses to this entry through the RSS 2.0 feed. You can leave a response, or trackback from your own site.